This is a short video of the presentation I will be giving at the Leir Conference on The Next Generation of Human Rights. My talk focuses on the use of digital technologies to leverage the crowdsourcing and crowdfeeding of human rights information. I draw on Ushahidi’s Swift River initiative to describe how crowdsourced information can be auto-validated. Challenges and Opportunities of Technology for Human Rights. I will be on presenting on the third panel together with colleagues from Witness.org and The Diarna Project. For more details on the larger subject of my presentation, please see this blog post on peer-producing human rights. The desired results of this conference are to allow participants to improve advocacy, funding, or operations through collaborative efforts and shared ideas in a natural setting. Molly Land at New York Law School has written an excellent paper on peer producing human rights, which will appear in the Alberta Law Review, 2009. This is one of the best pieces of research that I have come across on the topic. I highly recommend reading her article when published. Molly considers Wikipedia, YouTube and Witness.org in her excellent research but somewhat surprisingly does not reference Ushahidi. I thus summarize her main points below and draw on the case study of Ushahidi—particularly Swift River—to compare and contrast her analysis with my own research and experience. Human rights reporting is the most professionalized activity of human rights organizations. This professionalization exists “not because of an inherent desire to control the process, but rather as a practical response to the demands of reporting-namely, the need to ensure accuracy of the information contained in the report.” The question is whether peer-produced human rights reporting can achieve the same degree of accuracy without a comparable centralized hierarchy. Increased participation is often associated with an increased risk of inaccuracy. In fact, “even the perception of unreliability can be enough to provide […] a basis for critiquing the information as invalid.” Clearly, ensuring the trustworthiness of information in any peer-reviewed project is a continuing challenge. Wikipedia uses corrective editing as the primary mechanism to evaluate the accuracy of crowdsourced information. Molly argues that this may not work well in the human rights context because direct observation, interviews and interpretation are central to human rights research. To this end, “if the researcher contributes this information to a collaboratively-edited report, other contributors will be unable to verify the statements because they do not have access to either the witness’s statement or the information that led the researcher to conclude it was reliable.” Even if they were able to verify statements, much of human rights reporting is interpretive, which means that even experienced human rights professionals disagree about interpretive conclusions. Molly presents three potential models to outline how human rights reporting and advocacy might be democratized. The first two models focus on secondary and primary information respectively, while the third proposes certification by local NGOs. Molly outlines the advantages and challenges that each model presents. Below is a summary with my critiques. I do not address the third model because as noted by Molly it is not entirely participatory. The two central limitations of this approach are that (1) the model would be limited to a subset of available information restricted to online or print media; and (2) even limiting the subset of information might be insufficient to ensure reliability. To this end, this model might be best used to complement, not substitute, existing fact-finding efforts. This model still presents accuracy problems, however. “There would be no way to verify the information contributed and it would be easy for individuals to manipulate the system.” I don’t agree. The statement: “there would be no way to verify the information” is an exaggeration. There multiple methods that could be employed to determine the probability that the contributed information is reliable, which is the motivation behind our Swift River project at Ushahidi, which seeks to use crowdsourcing to filter human rights information. Since Swift River deserves an entire blog post to itself, I won’t describe the project. I’d just like to mention that the Ushahidi team just spent two days brainstorming creative ways that crowdsourced information could be verified. Stay tuned for more on Swift River. We can still address Molly’s concerns without reference to Ushahidi’s Swift River. Individuals who wanted to spread false allegations about a particular government or group, or to falsely refute such allegations, might make multiple entries (which would therefore corroborate each other) regarding a specific incident. Once picked up by other sources, such allegations ‘may take on a life of their own.’ NGOs using such information may feel compelled to verify this information, thus undermining some of the advantages that might otherwise be provided by peer production. Unlike Molly, I don’t see the challenge of crowdsourced human rights data as first and foremost a problem of accuracy but rather volume. Accuracy, in many instances, is a function of how many data points exist in our dataset. To be sure, more crowdsourced information can provide an ideal basis for triangulation and validation of peer produced human rights reporting-particularly if we embrace multimedia in addition to simply text. In addition, more information allows us to use probability analysis to determine the potential reliability of incoming reports. This would not undermine the advantages of peer-production. Of course, this method also faces some challenges since the success of triangulating crowdsourced human rights reports is dependent on volume. I’m not suggesting this is a perfect fix, but I do argue that this method will become increasingly tenable since we are only going to see more user-generated content, not less. For more on crowdsourcing and data validation, please see my previous posts here. Molly is concerned that a website allowing peer-production based on primary information may “become nothing more than an opinion site.” However, a crowdsourcing platform like Ushahidi is not an efficient platform for interactive opinion sharing. Witnesses simply report on events, when they took place and where. Unlike blogs, the platform does not provide a way for users to comment on individual reports. This means that the peer produced reporting does not “purport to represent a kind of verifiable ‘truth’ about the existence or non-existence of a particular set of facts,” so the issue of “accuracy is somewhat less acute.” Molly suggests that accuracy might be further improved by “requiring participants to register and identify themselves when they post information,” which would “help minimize the risk of manipulation of the system.” Moreover, this would allow participants to view each other’s contributions and enable a contributor to build a reputation for credible contributions. However, Molly points out that these potential solutions don’t change the fact that only those with Internet access would be able to contribute human right reports, which could “introduce significant bias considering that most victims and eyewitnesses of human rights violations are members of vulnerable populations with limited, if any, such access.” I agree with this general observation, but I’m surprised that Molly doesn’t reference the use of mobile phones (and other mobile technologies) as a way to collect testimony from individuals without access to the Internet or in inaccessible areas. In my opinion, peer produced advocacy faces the same challenges as traditional human rights advocacy. It is therefore important that the human rights community adopt a more tactical approach to human rights monitoring. At Ushahidi, for example, we’re working to add a “subscribe-to-alerts” feature, which will allow anyone to receive SMS alerts for specific locations. The point is to improve the situational awareness of those who find themselves at risk so they can get out of harm’s way and not become another human rights statistic. For more on tactical human rights, please see my previous blog post. Human rights organizations that are engaged in intervening to prevent human rights violations would also benefit from subscribing to Ushahidi. More importantly, the average person on the street would have the option of intervening as well. I, for one, am optimistic about the possibility of P2P human rights protection. One of the donors I’m in contact with about the proposed crisis mapping conference wisely recommended I add a big-picture background to crisis mapping. This blog post is my first pass at providing a brief history of the field. In a way, this is a combined summary of several other posts I have written on this blog over the past 12 months plus my latest thoughts on crisis mapping. Evidently, this account of history is very much influenced by my own experience so I may have unintentionally missed a few relevant crisis mapping projects. Note that by crisis I refer specifically to armed conflict and human rights violations. As usual, I welcome any feedback and comments you may have so I can improve my blog posts. The field of dynamic crisis mapping is new and rapidly changing. The three core drivers of this change are the increasingly available and accessible of (1) open-source, dynamic mapping tools; (2) mobile data collection technologies; and lastly (3) the development of new methodologies. Some experts at the cutting-edge of this change call the results “Neogeography,” which is essentially about “people using and creating their own maps, on their own terms and by combining elements of an existing toolset.” The revolution in applications for user-generated content and mobile technology provides the basis for widely distributed information collection and crowdsourcing—a term coined by Wired less than three years ago. The unprecedented rise in citizen journalism is stark evidence of this revolution. New methodologies for conflict trends analysis increasingly take spatial and/or inter-annual dynamics into account and thereby reveal conflict patterns that otherwise remain hidden when using traditional methodologies. Until recently, traditional mapping tools were expensive and highly technical geographic information systems (GIS), proprietary software that required extensive training to produce static maps. In terms of information collection, trained experts traditionally collected conflict and human rights data and documented these using hard-copy survey forms, which typically became proprietary once completed. Scholars began coding conflict event-data but data sharing was the exception rather than the rule. That is, conflict data was limited to the country-level and rarely updated more than once a year, which explains why methodologies did not seek to analyze sub-national and inter-annual variations for patterns of conflict and human rights abuses. In addition, scholars in the political sciences were more interested in identifying when conflict as likely to occur as opposed to where. For a more in-depth discussion of this issue, please see my paper from 2006 “On Scale and Complexity in Conflict Analysis” (PDF). The pivotal year for dynamic crisis mapping was 2005. This is the year that Google rolled out Google Earth. The application marks an important milestone in Neogeography because the free, user-friendly platform drastically reduced the cost of dynamic and interactive mapping—cost in terms of both availability and accessibility. Microsoft has since launched Virual Earth to compete with Google Earth and other potential contenders. FAST Maps are interactive geographic information systems that enable users of leading agencies to depict a multitude of complex interdependent indicators on a user-friendly and accessible two-dimensional map. […] Users have the option of selecting among a host of single and composite events and event types to investigate linkages [between events]. Events and event types can be superimposed and visualized through time using FAST Map’s animation feature. This enables users to go beyond studying a static picture of linkages to a more realistic dynamic visualization. 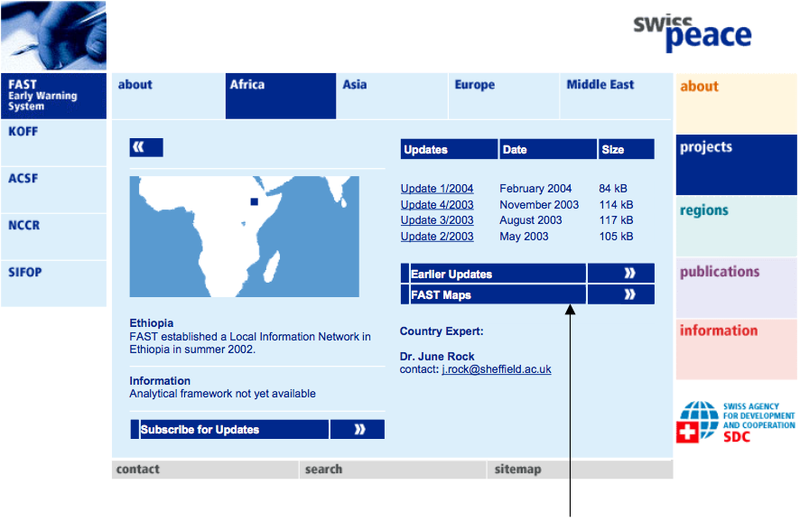 I just managed to dig up old documents from 2003 and found the interface I had designed for FAST Maps using the template at the time for Swisspeace’s website. However, GIS software was (and still is) prohibitively expensive and highly technical. To this end, Swisspeace was not compelled to make the necessary investments in 2004 to develop the first crisis mapping platform for producing dynamic crisis maps using geo-referenced conflict data. In hindsight, this was the right decision since Google Earth was rolled out the following year. With the arrival of Google Earth, a variety of dynamic crisis maps quickly emerged. In fact, one if not the first application of Google Earth for crisis mapping was carried out in 2006 by Jen Ziemke and I. We independently used Google Earth and newly available data from the Peace Research Institute, Oslo (PRIO) to visualize conflict data over time and space. (Note that both Jen and I were researchers at PRIO between 2006-2007). Jen used Google Earth to explain the dynamics and spatio-temporal variation in violence during the Angolan war. To do this, she first coded nearly 10,000 battle and massacre events as reported in the Portuguese press that took place over a 40 year period. Meanwhile, I produced additional dynamic crisis maps of the conflict in the Democratic Republic of the Congo (DRC) for PRIO and of the Colombian civil war for the Conflict Analysis Resource Center (CARC) in Bogota. At the time, researchers in Oslo and Bogota used proprietary GIS software to produce static maps (PDF) of their newly geo-referenced conflict data. PRIO eventually used Google Earth but only to publicize the novelty of their new geo-referenced historical conflict datasets. Since then, PRIO has continued to play an important role in analyzing the spatial dynamics of armed conflict by applying new quantitative methodologies. Together with universities in Europe, the Institute formed the Geographic Representations of War-net (GROW-net) in 2006, with the goal of “uncovering the causal mechanisms that generate civil violence within relevant historical and geographical and historical configurations.” In 2007, the Swiss Federal Institute of Technology in Zurich (ETH), a member of GROW-net, produced dynamic crisis maps using Google Earth for a project called WarViews. More recently, Automated Crisis Mapping (ACM), real-time and automated information collection mechanisms using natural language processing (NLP) have been developed for the automated and dynamic mapping of disaster and health-related events. Examples of such platforms include the Global Disaster Alert and Crisis System (GDACS), CrisisWire, Havaria and HealthMap. Similar platforms have been developed for automated mapping of other news events, such as Global Incident Map, BuzzTracker, Development Seed’s Managing the News, and the Joint Research Center’s European Media Monitor. Equally recent is the development of Mobile Crisis Mapping (MCM), mobile crowdsourcing platforms designed for the dynamic mapping of conflict and human rights data as exemplified by Ushahidi (with FrontLineSMS) and the Humanitarian Sensor Web (SensorWeb). Another important development around this time is the practice of participatory GIS preceded by the recognition that social maps and conflict maps can empower local communities and be used for conflict resolution. Like maps of natural disasters and environmental degradation, these can be developed and discussed at the community level to engage conversation and joint decision-making. This is a critical component since one of the goals of crisis mapping is to empower individuals to take better decisions. The Harvard Humanitarian Initiative (HHI) is currently playing a pivotal role in crafting the new field of dynamic crisis mapping. Coordinated by Jennifer Leaning and myself, HHI is completing a two-year applied research project on Crisis Mapping and Early Warning. This project comprised a critical and comprehensive evaluation of the field and the documentation of lessons learned, best practices as well as alternative and innovative approaches to crisis mapping and early warning. HHI also acts as an incubator for new projects and supported the conceptual development of new crisis mapping platforms like Ushahidi and the SensorWeb. In addition, HHI produced the first comparative and dynamic crisis map of Kenya by drawing on reports from the mainstream media, citizen journalists and Ushahidi to analyze spatial and temporal patterns of conflict events and communication flows during a crisis. 1) Crisis Map Sourcing (CMS) seeks to further research on the challenge of visualizing disparate sets of data ranging from structural and dynamic data to automated and mobile crisis mapping data. The challenge of CMS is to develop appropriate methods and best practices for mashing data from Automated Crisis Mapping (ACM) tools and Mobile Crisis Mapping platforms (see below) to add value to Crisis Mapping Analytics (also below). 2) The purpose of setting an applied-research agenda for Mobile Crisis Mapping, or MCM, is to recognize that the future of distributed information collection and crowdsourcing will be increasingly driven by mobile technologies and new information ecosystems. This presents the crisis mapping community with a host of pressing challenges ranging from data validation and manipulation to data security. These hurdles need to be addressed directly by the crisis mapping community so that new and creative solutions can be applied earlier rather than later. If the persistent problem of data quality is not adequately resolved, then policy makers may question the reliability of crisis mapping for conflict prevention, rapid response and the documentation of human rights violations. Worse still, inaccurate data may put lives at risk. 3) Crisis Mapping Analytics (CMA) is the third critical area of research set by HHI. CMA is becoming increasingly important given the unprecedented volume of geo-referenced data that is rapidly becoming available. Existing academic platforms like WarViews and operational MCM platforms like Ushahidi do not include features that allow practitioners, scholars and the public to query the data and to visually analyze and identify the underlying spatial dynamics of the conflict and human rights data. This is largely true of Automated Crisis Mapping (ACM) tools as well. In other words, new and informative metrics are need to be developed to identify patterns in human rights abuses and violent conflict both retrospectively and in real-time. In addition, existing techniques from spatial econometrics need to be rendered more accessible to non-statisticians and built into existing dynamic crisis mapping platforms. Jen Ziemke and I thus conclude that the most pressing need in the field of crisis mapping is to bridge the gap between scholars and practitioners who self-identify as crisis mappers. This is the most pressing issue because bridging that divide will enable the field of crisis mapping to effectively and efficiently move forward by pursuing the three research agendas set out by the Harvard Humanitarian Initiative (HHI). We think this is key to moving the crisis-mapping field into more mainstream humanitarian and human rights work—i.e., operational response. But doing so first requires that leading crisis mapping scholars and practitioners proactively bridge the existing gap. This is the core goal of the crisis mapping conference that we propose to organize. I’ve been wanting to read “New Tactics in Human Rights: A Resource for Practitioners” for a while and finally found the time on the flight back from Geneva. I would definitely recommend reading New Tactics (PDF). The report combines some of my main interests: nonviolent civil resistance, tactical early warning and response, civilian protection, preparedness, technology and complex systems. I really appreciate the group’s serious focus on tactics since most human rights organizations seem to focus more on grand strategy and advocacy—and this at the expense of tactics. Tactical innovation is critical to the successful implementation of human rights around the globe. By expanding our thinking both tactically and strategically, the human rights community has the opportunity to be more effective. There is often a pattern to human rights abuses—they occur in predictable places under predictable circumstances. Recognizing those patterns and disrupting them can be key to protecting human rights. While intervention tactics are often associated with protest and resistance, some of the most dramatic successes in ending human rights abuses have resulted from negotiation and persuasion. The report includes numerous tactics and operational examples. I summarize 5 below. I also include a brief note on self-protection and a brief conclusion. Tactic: Protecting arrested demonstrators by protesting outside police stations where they are being detained. This tactic was employed by the anti-Milosevic student resistance movement, Otpor, in Serbia. Otpor put substantial time and effort into building a strong, extensive and loyal network that could be mobilized quickly. Extensive planning outlined who would call whom and exactly what each person was to do after the arrests, so that the second demonstration would follow the arrests almost instantaneously. Most contact information for the network was stored on individual members’ mobile phones, so that the police could not seize or destroy the information. Tactic: maintaining a physical presence at the site of potential abuse to monitor and prevent human rights violations. Machsom Watch in the West Bank uses the presence of Israeli women to protect Palestinians passing through Israeli checkpoints to ensure their rights are respected. Monitors who witness abuses make detailed reports and publish them on their website. They invite journalists, politicians and others to join them at the checkpoints. And they wear tags that read in Arabic “No to the checkpoints!” This show of support is heartening to many Palestinians, who may not have a positive image of Israelis. Tactic: using mobile phones to create a network of communication that can stop violence before it escalates. Like any conflict, there are people on both sides who want to prevent the escalation of violence. So the Interaction Belfast group identified leaders in each community who want to prevent violence and provided them with needed information. During events that are likely to cause violence […] the network plans ahead to monitor key areas. Volunteers recognize that they are able to intervene most effectively in cases of ‘recreational violence’— youth seeking excitement or responding to rumors […]. When volunteers see or hear of crowds gathering [in potential areas of conflict], or hear of rumors of violence about to occur on the other side, they call their counterparts […]. Volunteers calm crowds on their own sides before the incidents become violent. Since the program began, the phone network has both prevented violence and provided communities on both sides of the interface with more accurate information when violence does occur. Tactic: creating a single mass expression of protest based on a simple activity that citizens can safely carry out in their own homes. This tactic was used by the “Campaign of Darkness for Light” in Turkey, which mobilized some 30 million people to flick their lights on and to protest against government corruption. With many citiznes afraid to participate in political action, organizations needed a tactic of low personal risk that would overcome the sense of isolation that comes with fear. Organizers initially proposed that citizens turn off their lights for one minute each night. […]. By the second week, communities began to improvise, initiating different street actions, including banging post and pans. By the time organizers halted the action, the campaign had gone on for more than a month. Unfortunately, the report’s 2-page section on “Self-Care: Caring for Your Most Valuable Resource,” is not as well developed as the others. The report could have drawn more extensively from civil resistance training and digital activism. There is also much to be learned from survivor testimonies and security training manuals from field based UN-agencies operating in places like Somalia. That aside, I think the New Tactics group is doing some of the most exciting research in thiearea of tactics for civilian protection for communities at risk. I highly recommend spending time on their website and browsing through the rich materials they provide. Active monitoring using frequently acquired imagery. 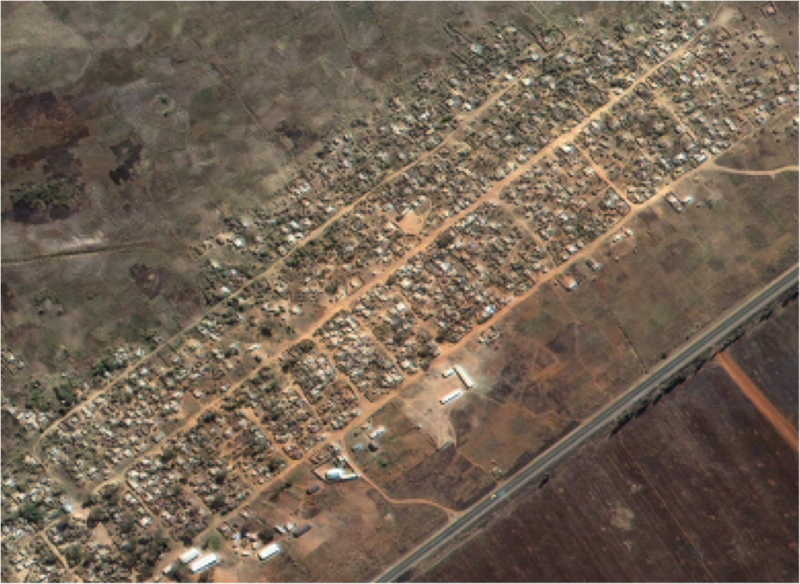 Lars shared satellite imagery from two human rights projects. The first is of a farm in Zimbabwe which was destroyed as part of a voter-intimidation campaign. The picture below was taken in 2002 and cost $250 to purchase. A total of 870 structure were manually counted. 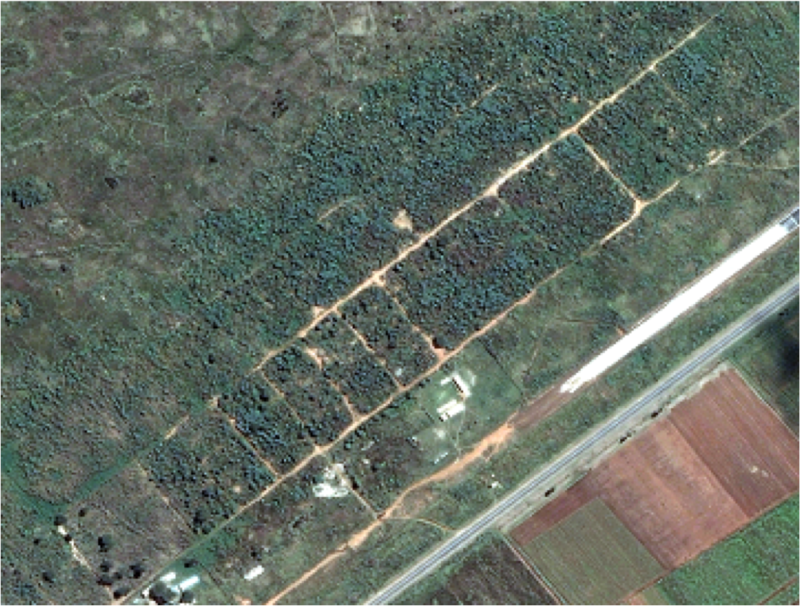 Copyright 2009 DigitalGlobe. Produced by AAAS. The second project sought to identify burned villages in Burma. Some 70 locations of interest within Burma were compiled using information from local NGOs. The image below is of a village in Papun District taken in December 2006. 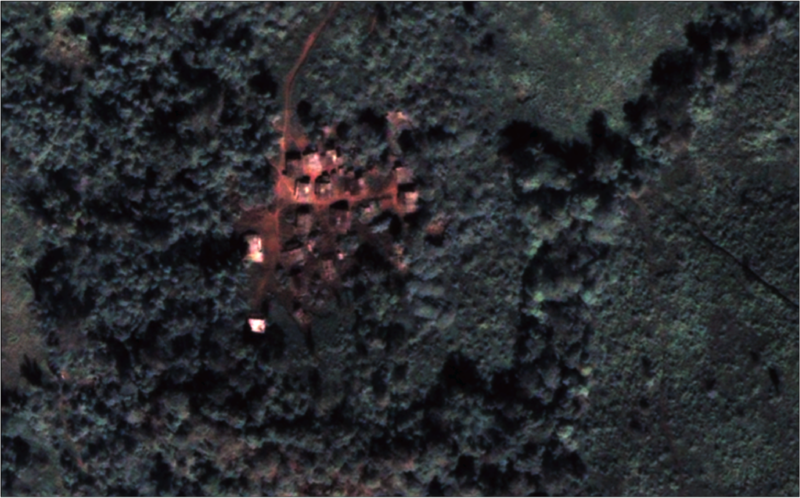 The satellite image below as taken in June 2007 after the Free Burma Rangers reported an incident of village burning in April. Satellites are owned by governments and companies which present ethical concerns. 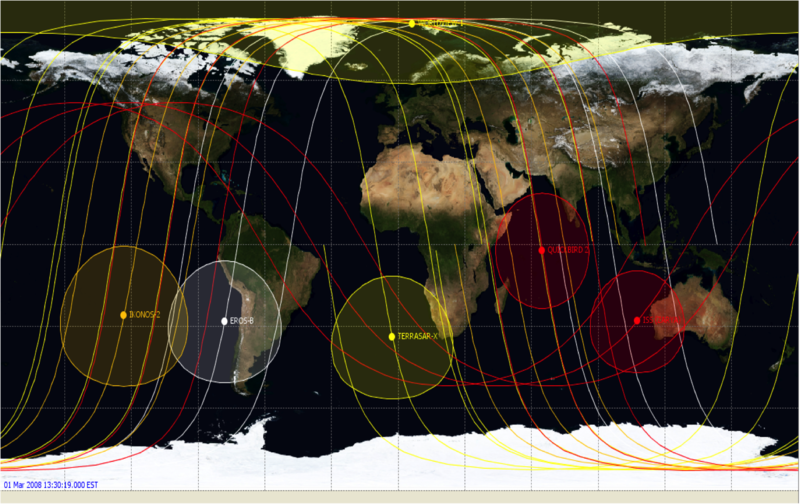 Nevertheless, Lars is confident that real-time and rapid use of satellite imagery will be possible in the future. 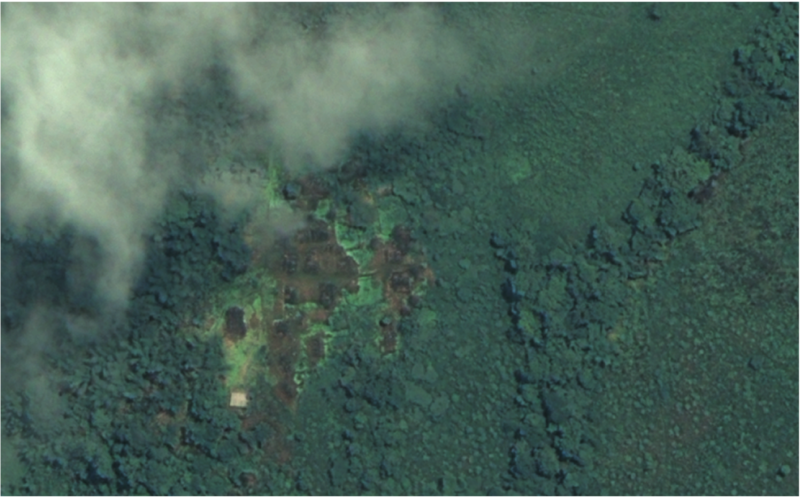 Evidence from satellite imagery becomes more powerful when combined with field-data. 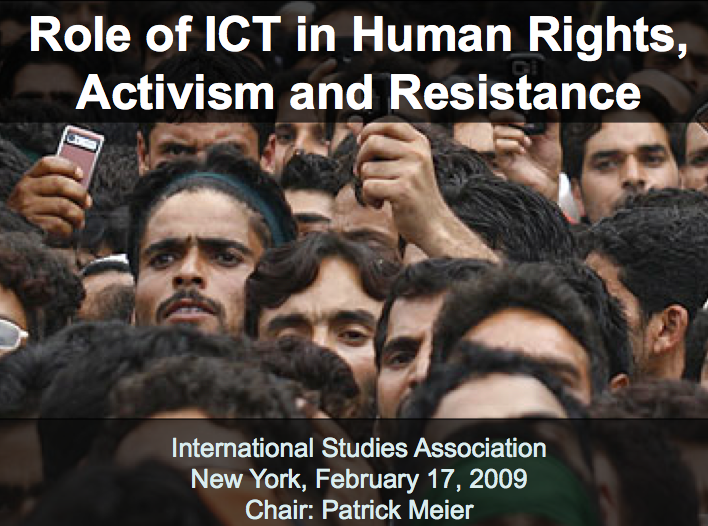 I just chaired a very productive panel at the International Studies Association (ISA) on the impact of ICTs on human rights, political activism and resistance. I’ve already blogged about each of the papers individually (see links above) so what follows are points from some of the presentations that I found particularly interesting. I also include the superb feedback that our discussant Professor Dan Drezner from The Fletcher School provided along with a summary of the productive Q&A session we had. Muñoz and de Soysa: Their results show that Internet access leads to increasing respect of human rights by governments. This is true of both democracies and authoritarian regimes. Joshua Goldstein: The role that Safaricom (a private telecommunications company) had in seeking to prevent and/or mitigate the election violence is unprecedented. Not only did the company refuse switch of the SMS network as per the government’s request, the company also sent out broadcast SMS to call on restraint and civic behavior. The papers were definitely panel material as they all address important issues related to ICTs that overlap in very interesting ways. So overall, this was great set of papers and presentations, and panelists ought to make sure they read and learn from each others’ papers. Patrick should expand his set of countries beyond the 22 countries. The dynamic between states and society vis-a-vis repression and circumvention may be an evolutionary one based on learning behavior. The papers should treat ICTs not as independent variables but as an interactive variable with factors such as unemployment. In other words, the question should be: to what extent does ICT interact with other variables that we know ought to trigger protests? The studies should separate anti-foreign protests from anti-government protests. The large-N analyses should include more control variables such as dummy varibales for elections and wars. The studies should also seek to assess the relationship between ICTs and the magnitude of protests and not only the frequency of protests. The papers do not take into account the role of the Diaspora in helping to mobilize, organize and coordinate protests. On the bias towards finding a statistical relationship and expanding the number of countries in my study, I disagreed with Professor Drezner. I specifically chose the 22 countries in my dataset because the regimes in these countries are actively using ICTs to censor, repress, monitor and block information. So if anything, the cards are stacked against resistance movements when it comes to these countries. Hence my not planning to expand the dataset to include additional countries. Professor Drezner agreed on both points. I completely agree on the evolutionary dynamic, which I described in my dissertation proposal and which explains why I often refer to the dynamic as a cyber game of cat-and-mouse. I’m not entirely sold on treating ICTs as an interactive variable but will explore this nonetheless. Agreed on the suggestion that anti-foreign protests be treated seperately since these protests are often organized by repressive regimes. I fully agree on adding more control variables including elections, wars and population. I concur with the point made about the magnitude of protests but this information is hard to come by. More importantly, however, the dataset I’m using is based on Reuters newswires and the reason I’m using this data is because Reuters is highly unlikely to report on low-level protests but rather on protests that have a national impact. So the dataset serves as a filter for large-scale protests and hence magnitude. Very good point about the diaspora. Repressive regimes learning from one another about how to use ICTs for censorship, repression, monitoring, etc. and resistance movement learning from each other. The side to first acquire and apply new technology generally gets a head start, but this prompts the other side, e.g., the State to catch up and regain the upper hand. Who are the users of these technologies? Demographics, gender, age, etc, should be important factors in the study of ICTs, State and society. One member of the audience was a policy maker with the British government and wanted to know what role Western governments should play vis-a-vis digital activism. The issue of civil resistance and the intersection with digital activism came up repeatedly in the discussion. Understanding one without the other is increasingly meaningless.